Sunflowers are a commonly used symbol for a world free of nuclear weapons and nuclear power. In the 1980s, US peace campaigners broke into missile silos and planted sunflowers to show their support for nuclear disarmament. 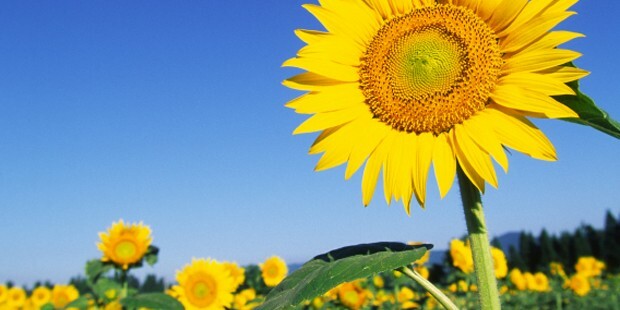 When Ukraine became a nuclear-weapon-free nation in 1996, US Defense Secretary William Perry declared that “sunflowers instead of missiles in the soil would ensure peace for future generations”. Activists around the world have also planted sunflowers as a sign of solidarity with the people of Chernobyl and Fukushima, who have suffered greatly from radioactive contamination following major meltdowns at nuclear reactors. There is only one safe nuclear reactor in the universe, they say – the Sun, located 150 million kilometres from Earth. Distribute sunflower seeds: Hand out sunflower seeds in a public place. Accompany them with information explaining their symbolic importance. Plant sunflowers: Sow the seeds at your school or community garden. You might also like to brighten up unused public spaces such as roundabouts.